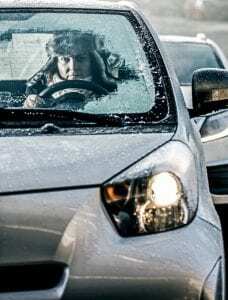 Early morning winter commute, woman driving a car on the frosty morning. Most accident victims don’t comprehend the difference between opening an insurance claim and filing a lawsuit. They assume that once you make an insurance claim, you automatically open a lawsuit as well, but this not necessarily true. You can open an insurance claim without filing a lawsuit as long as you do so before the statute of limitations for filing a claim has expired. An experienced attorney will make sure that you don’t let the statute of limitations lapse without filing a claim or lawsuit to recover the damages you have suffered as a result of the accident. In most cases, an insurance claim is filed first without a lawsuit being filed. In fact, a lawsuit is usually only filed if the insurance company is being unreasonable with regards to paying you a fair and appropriate settlement. An insurance claim is the informal process by which you seek compensation for your injuries and losses from the at-fault party’s insurance company. Opening an insurance claim simply requires making a phone call or sending a letter to the insurance company. Once they have been contacted, they will open claim for you and give you a claim number. You and your attorney will then collect all of your medical records and medical bills, document all of your lost wages and property damage, and assess the amount of pain and suffering you will have to endure, then submit everything directly to the insurance company. Once this is done, you will contact the insurance adjuster or the representative for the insurance company and begin negotiating a settlement for your damages. If the insurance company is fairly certain that their insured is at fault (or primarily at fault) for the accident in which you were injured, they will respond to you with a reasonable settlement offer. On the other hand, if they don’t believe that their insured is at fault (or primarily at fault), they may deny your claim or respond with a very low settlement offer. You, with the help of an experienced attorney, will then need to decide whether to continue your attempt to negotiate with the insurance company, accept the offer being made to you, or to file a lawsuit to seek the compensation you deserve. A lawsuit, specifically a personal injury lawsuit, is the formal legal process in which you seek to recover damages from the party that has caused you harm. It requires you to have an attorney file certain papers with the court and following on through legal proceedings with the case. During the lawsuit, subpoenas and depositions will be used to gather information regarding the accident, the nature of your injuries, and the damages you seek. In addition, the parties to the lawsuit may employ witnesses to testify in court in support of their position. Ultimately, however, a lawsuit will be resolved either by actually going to trial and having a jury determine the value of your case, or by settling it out of court, perhaps through a process called mediation. Either way, there are significant differences between opening an insurance claim and filing a lawsuit. Most importantly, an insurance claim can be resolved within a few months after you finish being treated for your injuries. On the other hand, a lawsuit can go on for years without being resolved. For this reason, lawsuits are usually reserved for more serious injuries, where the injured person will require more extensive medical treatment and/or where the amount of damages under consideration is relatively high. As mentioned above, an insurance claim is usually opened first without a lawsuit being filed, unless the lawsuit is necessary to recover the full amount of compensation you deserve. However, some attorneys prefer to file a lawsuit earlier in the process—sometimes before making a settlement demand and sometimes before you are finished being treated for your injuries. There are two strategic reasons this. First and most common, in a particularly busy jurisdiction the waiting time between filing a lawsuit and having a trial scheduled can be very long—as long as several years. In that situation, it might be beneficial to file a lawsuit as soon as possible in order to get in line for a trial date. Secondly, sometimes a lawyer will go ahead and file a lawsuit simply because he or she knows that the case has very little chance of settling. This might be because the particular insurance company or adjuster has refused to settle cases similar to yours in the past, or because your accident occurred in a jurisdiction where insurance companies, in general, rarely settle cases such as yours. Based on this experience, your lawyer might see no point in waiting to file a lawsuit.